Amalfi town from the shoreline. 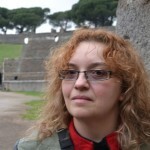 All photos on this page are by the author, sockii. The Amalfi Coast of Italy is blessed with incredible natural beauty and charming, historic towns — perhaps none so historically important as the town of Amalfi itself. While today it is largely a tourist destination filled with cafes, shops and hotels, it was once an important maritime republic known as the Duchy of Amalfi. The town is absolutely worth a visit if touring the coast for the day, or perhaps spending a week traveling from one scenic coastal attraction to the next. 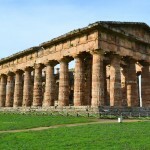 Nearby are many more delightful places to visit: the hill town of Ravello, famous Positano, historic Salerno and the classic tourist retreat, Sorrento. Each has its own unique charms and delights worth discovering. 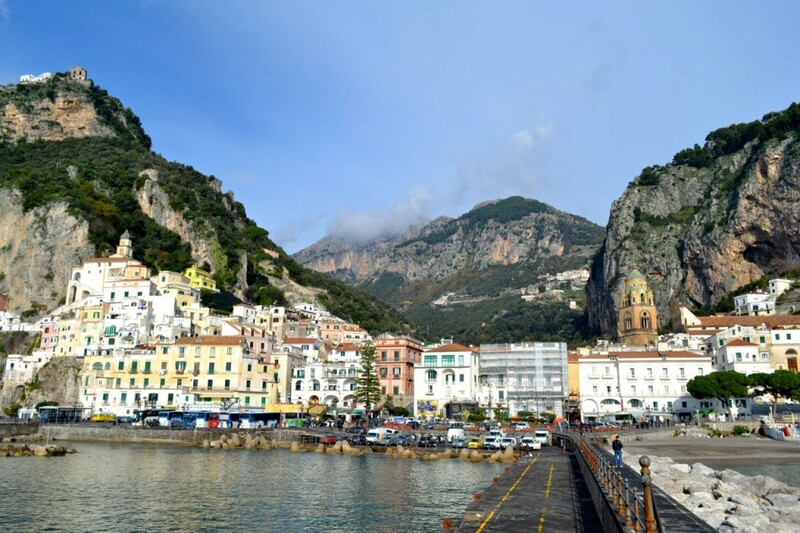 Here you will find some basic information about Amalfi including its history, major attractions, and how to travel there. 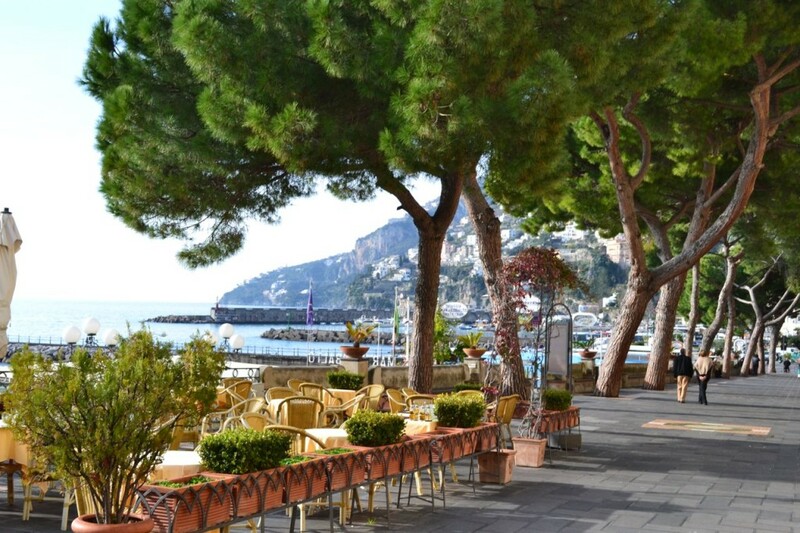 Grab a table with a view of the water, or walk along the promenade in Amalfi town. The Amalfi Coast as seen from the town. 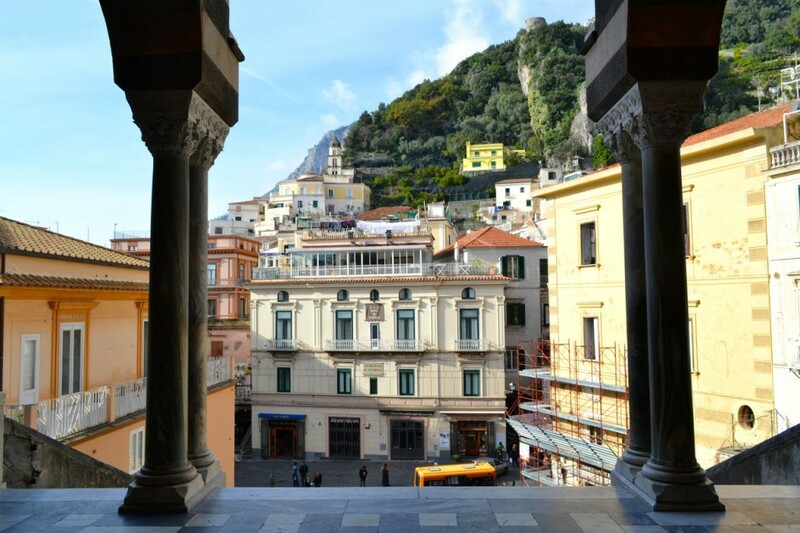 Historical references to Amalfi date back to the 6th century. It very quickly grew into an important and wealthy maritime power because its coastal location made it prime for trading routes. Grains from the inland regions and salt from Sardinia were traded for gold dinars minted in Egypt and Syria – which merchants then used to buy Byzantine silks to resell in the West. 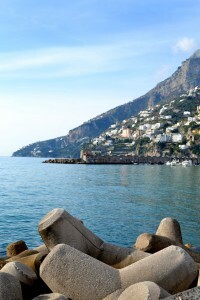 As such, Amalfi was already powerful and rich just as Venice was beginning to grow and flourish. Amalfi was an independent republic from the 7th century through to the year 1075, rivaling Pisa and Genoa. But in 1073 it fell to the Normans and began to enter a decline of importance, and in the 1130 it was conquered by Pisa. A major earthquake in 1343 led to a tsunami which destroyed much of the lower part of the town and its port; after that, it never regained significance beyond a local scale in the region. Even so, Amalfi has long been popular with vacationers and a town that catered to travelers, particularly since the 1800s. Convents were converted to hotels and famous visitors to the town include the composer Richard Wagner. You can learn more about the history of Amalfi at Wikipedia and also the Comune di Amalfi official website. The colorful belltower with its Arabic design influences. 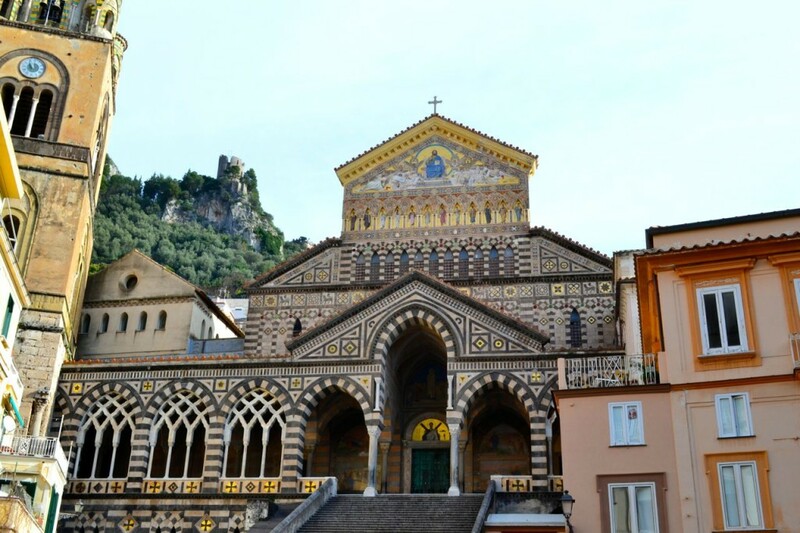 There are a number of interesting and historic sites in Amalfi town you should be sure to visit if you have the chance – besides enjoying the natural beauty, of course! 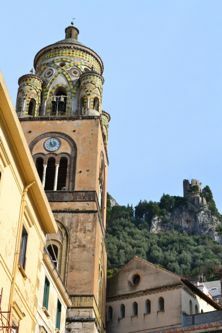 The Duomo di Amalfi or Amalfi Cathedral is unmistakeable as soon as you approach the town. The church dates back to the 9th century and features unique Arab–Norman Romanesque architecture, although it has been modified in later centuries to add Byzantine, Baroque and Gothic elements as well. The exterior of the church is particularly striking, with its 62 wide, deep steps leading up to bronze doors that date back to before the year 1066! The off-center bell tower is also beautiful, featuring Arabic elements as well as majolica tiles. The church is dedicated to Saint Andrew and his remains were reportedly brought to the crypt during the Fourth Crusade. Attached to the Duomo is also the noteworthy Cloister of Paradise, a quiet and reflective space with attractive mosaics and frescoes – great for escaping from the crowds of tourists on the streets. The Paper Mill Museum is a unique and small museum in Amalfi dedicated to the art of paper-making. View antique equipment dating from medieval times, and even get a chance to make your own paper! It’s a great hands-on experience for the young and old alike. Once you’re done sightseeing, be sure to spend some time exploring the shops and galleries of town. You’ll find lot of products featuring the legendary lemons and limoncello of the region, everything from bath soaps to limoncello pastas and chocolates! There are also shops selling beautiful ceramics, clothing and jewelry. Choose a table at one of the town’s many cafes and restaurants and you can enjoy delicious seafood specialties of the region and of course try the famous delizia al limone for dessert (mini sponge cakes filled with lemon cream) or a cooling afternoon snack. 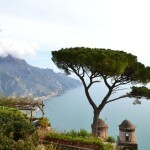 Wikitravel offers a good guide to your basic travel, lodging and dining options in Amalfi town and the surrounding area. As the town is quite popular with tourists you will find many amenities in the town open year round: shops, restaurants, and places to stay ranging from luxury hotels and villas clinging to the coastline to cozy, affordable rental apartments. From Easter through October you may do better taking one of the ferry boat services which operate throughout the region, with stops including Naples, Capri, Amalfi and Salerno. The boat ride can be much more relaxing and faster than navigating the roads, but taking an Amalfi Coast drive is certainly something you should experience in your Italy travels! 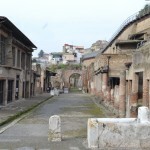 There is a large underground parking lot on the edge of the town which you can use to then explore the town on foot, much recommended as parking is very limited otherwise. TheAmalfiCoast.net is an excellent resource for all you need to know, from current bus and ferry schedules to weather forecasts and current events. How long you choose to stay in Amalfi is up to your interests and style travel; you can visit for just a day or plan to stay for several nights to relax and then explore the coast. It’s up to you! 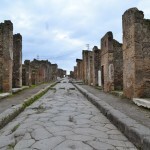 Just be aware of the driving times and conditions if you wish to explore further afield, such as further south to Paestum or to the ruins of Pompeii or Herculaneum. Learn more about the unique art and architecture of Amalfi from the time of its greatest importance and power in this scholarly title from Cambridge University Press.